...and a new Elefantz SHOP!!! I'm almost ready to open it's online doors. Another day or two and you can come inside for the big opening party. One thing I have to show you today is the remake of my "A Christmas Story" quilt in the lovely pastels from my lefover Aviary and Robyn Pandolph stash! ...and this is my remake! I love the softer colours! 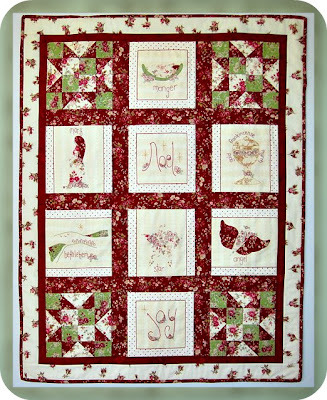 Tomorrow I am posting the quilt top off to wonder-girl Dawn, who will weave her magic and quilt it for me. It will lovely to have it hanging in my soon-to-be-new-home. Dawn has also quilted my Shabby Roses quilt remake, and tonight I'll stitch down the binding so I can take pics tomorrow and show you. I'm really happy with these two new versions of my designs. All coming together for you. Hope you enjoy your new home and all the challenges of living in a new city. Oh Jenny, I am so happy that you found a lovely home and Mr E is back teaching. Your new home looks so lovely and I am sure you will both be really happy there. The powers of prayer, eh? Welcome to our City, its pretty warm here in the summer, but Winter is glorious.... Contact me if you want to get together for coffee. Good luck in 2012 with all things new. My Neice lives in townsville and I spent 2 months there at Oonnoonba a few years ago. I love the srand though I believe they have done it up more. Looks like a lovely new home for the elefantz clan Jen!! When's the big moving day?? Looks like everything's falling into place for you all and that's so great :o). A fresh start for the New Year. Your new house looks great. I'm sure you will turn it into a home in no time. Have fun packing. Nice home and a nice job for Mr E! New shops and new venues to explore and I'm sure you and Mr E will discover some lovely new places to visit :). So glad you found a new place to live in - it looks like its going to be large enough and very modern! I am sure you will grow to love it with all your shabby chic decorations and homely touches. Here's to new beginnings, new chapters, much happiness. Oh gosh Jen, I hope we don't get any big cyclones this season. I was worried enough with you living in CT! But now you're there, you gotta go visit the aquarium, it's awesome!! And when you go swimming at the beach, take a bottle of vinegar and wear pantyhose! And don't pick up any cone shells without using a LONG stick to check if they're dead or empty. And watch out for blue ringed octopus in the rock pools. And crocs in the creeks...and at the beach...and in swimming pools. Hope you will settle in soon. Good luck in your new home. Sew good that everything is going as planned for you. Your new home looks great. I am sure you are pleased Mr E is back teaching again. First, welcome home. I hope you & yours will be very happy there. Second- love your quilt. Both versions. 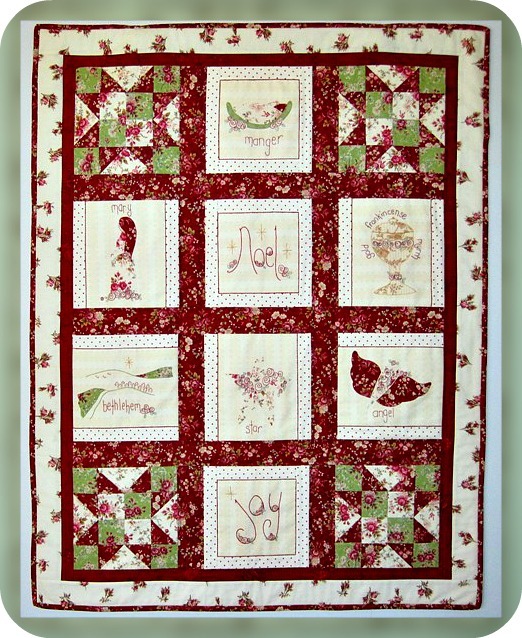 I like the traditional style of your quilts with some of the blocks having your definate ELEFANTZ style inside them. It all comes together so well. Jenny, That is GREAT! Congratulations to Mr. E on the new teaching job. And to both of you on your lovely new home! Your quilt is beautiful. I can't wait to make my own. I really can't wait till you open your shop, you know I love too look at your beautiful things! Hope your move goes well. A lot of news for you in the new year! It looks like a beautiful new home, I am sure you will fill it with love and happiness. Good luck with all the new coming on! Congrats on finding a new home in such a short time. Good luck in this latest chapter of your lives. Jenny, what a lovely home you're moving to.....and how exciting to have new neighbors and a shop. Is Blossom moving with you? Happy New Year. Congrats on finding a new home to live in. I like it from the outside. Can't wait to see how you decorate the inside. A lovely pastel dream - the quilt. Move forward in you "new" life Jenny - I know you both will be very successful. Congrats on the new shop. I am so happy to hear Mr. E has a new job and you have a new city and home to look forward to. Prayers have been answered and things are falling into place. Love the new look of your quilt and best of luck with your new shop, too! I'm liking the soft version as well, cozy looking. Congrats with the new home and new ventures. Hope you be very happy in your new home and city.Have fun! Wow!!! So happy for you guys--everything is coming together great!!! This is going to make you a Power Puff Girl--sorry it is just going to stick in my mind now that you live in the city of Townsville. I love the new pastel version and can't wait to see what's new in your shop. Wishing you every happiness in your new home. I'm looking forward to the interior shots of the house as you make it your home. I think the name of the city is funny - like someone with absolutely NO imagination named it! I'm so glad things are coming together for the Elefantz family. Jenny, it is so good to hear that the New Year has brought you an abundance of good things. May the year ahead be filled with love, joy and good health to you and your family. I love the revamp of that quilt. Glad to hear everything's working out for you and Mr E.
Love your new version of your quilt - very soft and pretty! I'm sure that your new house will definitely become home in now time with all of your personal touches. Have you ever taken a counting of how many places you have lived? I've lived in 4 places but my friend (who is 79) has lived all her life in the home she grew up. Lots of changes, Jenny. You will handle them with grace and peace. You've been busy, and sounds like this is just the beginning. Love the shop, and it looks like lots of room for Mr. E's bikes! Those are a lot of changes to deal with in a short amount of time! I hope everything goes smoothly. Looks like it wasn't too difficult to find a place to live. It's a pretty house. I hope you make lots of new friends there, though knowing you, you probably already know several people in Townsville. All the best. I'm so glad to hear Mr E has a job! It must be a relief for you both, although moving house is always a lot of work. I hope he loves the job!